I'm not one of those types who will declare that you simply must play a game. Games, and in particular those that want to be different, will inherently illicit a more subjective reaction than many other titles. There is no doubt that Journey will be an acquired taste. 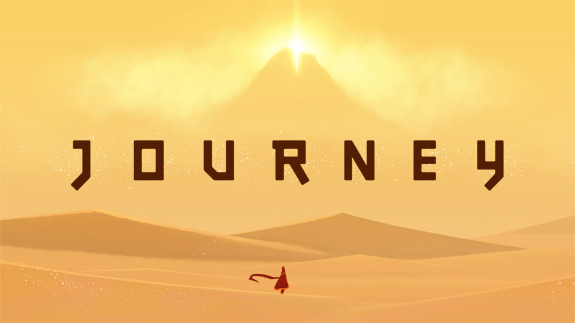 There will be some gamers who will not even see Journey as a game, at least not in the terms they are used to. However what it was for me, was a magical, and exceptionally well crafted experience, and one that I would urge open minded gamers to experience for themselves. Journey, from ThatGameCompany (the folks behind Flow and Flower) might just have finally found their perfect blend of art, experience and game. While some might wish to make games function as art, purely for the sake of art - a claim many would probably aim at the folks from Tale of Tales that I've written about here before - here, ThatGameCompany have managed to craft something that reacts so smoothly to the inputs you provide, that it actually manages to hide the fact that you often aren't in control of this particular ride, and still have it succeed as an immersive experience. In Journey you take on the role of a strange stylized nomad, navigating a series of wonderfully conceived landscapes, apparently at the behest of some strange, white robbed, being, possibly a deity. You are never sure because the game never really feels the need to explain it's story. It is quite happy for you to take from it whatever you want to. The story of the world you navigate is only ever rather cryptically revealed in a series of wonderful pictorial friezes that you uncover as you progress. To explain too much of the gameplay would amount to far too much of a spoiler to the experience. You should simply approach the game with an open mind and allow it to take you along for the ride. Suffice to say that the controls are intuitive and not once did I fight with the controller in frustration or annoyance. In some ways the experience is equal parts music and design. I couldn't shake the feeling that the experience would ultimately have fallen a little flat without the inspiring sound design and score that is tightly woven into the experience. It ebbs and flows beautifully, gracefully accompanying the pace of each section of the game. It creates tension and dictates pace, and flows fluidly between almost meditative melancholy and a sense of urgency. It deserves every award thrown in it's direction. It is also highlights one of the most interesting elements of the game for me, in particular with my game designer hat on. The music is successful by and large because it is so tightly scripted with the action, and what allows that combination to be effective is because, when needed, the action is extremely tightly scripted. So much so that for quite a few sections of the game, you aren't really in control of your character. However, the genius in the design is that you often genuinely don't notice. You feel as if you are in control, and that suffices for the section to be successful, and feel satisfying. You are, in effect, being swept along on a journey to the extent that you are unaware of when the games has cleverly taken control from you. The addition of a fellow traveler (or travelers) who join you on your journey is inspired. When online you may find another player at your side, you cannot communicate, and do not know their name, but you can see them in your world, and see how they navigate the same space. I was wonderfully ignorant of this feature on my first play through, and for a while marveled at how oddly human the AI of this other character was. They were equally likely to show you the way as they were to lead you astray, or simply demonstrated how someone else might approach an area in a totally different way than was natural for you. It's a simple addition, but one that is extremely influential, in particular on a few of the later areas, where you almost feel this human affinity with your partner when the characters are facing their greatest challenges. All in all, it is a wonderfully different experience. Finally, in talking about Journey you simply can't ignore the run time. Yes, it is indeed only around two hours long. However, I am not the type that requires much relative time spent to deem an experience worthy or otherwise. I have paid more for movie tickets, so the run time doesn't adversely impact my enjoyment of the experience. If your perception of 'value for money' depends solely on an hours per dollar calculation then yes, Journey is undeniably short. It is however a Journey worth every single second spent navigating it. Early or not, game of the year for me! Sony deserve credit for bankrolling a game that was this risky as a commercial venture. Gorgeous game, thanks for the recommendation. I usually avoid the playstation online store after all the crap last year, but this was worth the purchase. Game of the year so far!